START (project support type) is now accepting proposals for the FY2019 (Japanese). Cool ALD Corporation was established based on the achievement of the START program. 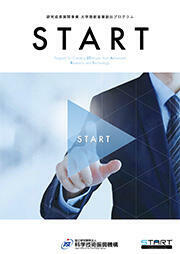 DDSNA, Inc. was established based on the achievement of the START program (Japanese). 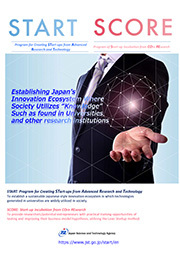 SCORE is now accepting proposals for the FY2019 (Japanese). SCORE call for proposals briefing session for the FY2019 will be held on May 8th (Wed), 13 (Mon) (Japanese). Find ex-post evaluation results of 2018 SCORE projects (Japanese). 17 teams pitched their business models for START project promoters on SCORE Demo Day (Japanese).